Irish Water has confirmed the number of customers without water is 48,000, while 137,000 homes and businesses remain without power after Storm Ophelia brought down trees and power lines across the country. The utility company has said that 109,000 customers were without water supply at its peak at midday today. It also said that it is working with the ESB to restore the supply. The National Emergency Coordination Group said huge progress was made today as a massive clear got underway. At a briefing in Dublin this evening, the NECG said public transport was practically in full operation today except for the Luas in Dublin, which resumed at 9.30pm tonight. Electricity power failures are resulting in a number of wastewater treatment plants and a significant number of sewage pumping stations discharging untreated or partially treated wastewater into lakes, rivers, estuaries and the sea. It says the situation is being monitored by the Environmental Protection Agency. More than 100,000 customers are relying on supply from reservoirs, and may be without supply if these run low. Irish Water Managing Director Jerry Grant said it has reduced the number of customers who were at risk of losing water by 260,000. There had been earlier warnings that as many as 300,000 homes would lose supply because pumps and treatment works are stalled by the power cuts. He said the worst affected areas were from Wexford to Skibbereen in west Cork, including Wexford town, Enniscorthy, New Ross, Castlecomer, Bennetsbridge, Cobh, Youghal and Fermoy, with difficulties also in Bandon. The provider said they are co-ordinating up to 30 water tankers to the affected areas and are working with local authorities to ensure more are available if needed. The ESB has said that 137,000 customers remain without power, with the worst-affected areas in the south and southwest of the country. At the peak of yesterday's storm, the numbers affected peaked at 385,000, but 248,000 have now had their power restored. They say they are hopeful that most customers in the northwest will have their power restored tonight, while they say significant progress is being made in counties Kerry, Laois, Galway, Clare and Westmeath. Priority is being given to the restoration of supplies for water and communications services. The ESB said it has 2,000 staff, plus a further 1,000 contractors on the ground working on repairs, as well as helicopters surveying the scene from the air. They hope to have most customers restored to service within three to four days, though it could take over a week for customers in more rural or remote areas. Speaking on RTÉs Today with Seán O'Rourke, ESB Corporate Communications Manager Bernardine Maloney said power should be restored to the majority of homes and businesses within three to four days, but it could take longer in rural areas. Ms Maloney said customers can alert ESB via the website and app if they are still experiencing power outages. She said: "There are a lot of power lines down, people will not know by looking at them whether they're live or not. They should contact us on 1850 7372 999. If your phone still has charge on it there's a compass on the ESB networks app, where people can tell us the location of the power lines down, that would be really great." Meanwhile, Luas services have resumed on the Red and Green lines this evening following repair works at a depot in Clondalkin. The roof on the Red Cow Luas depot was damaged yesterday afternoon and the repairs have taken a day to complete. The damaged section is over the technical rooms, which are necessary to run Luas operations. 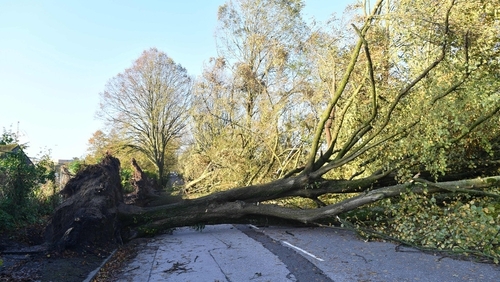 AA Ireland has urged motorists to exercise caution and allow extra travel time, as debris and fallen trees are still likely to present problems. Eir has estimated that about 150,000 customers are without broadband, telephone and mobile services as a result of Storm Ophelia. The company said the storm had delivered unprecedented and widespread levels of damage to its infrastructure, including damage to poles and cables. It said that while damage has been sustained throughout the country, the southwest and midlands are the worst affected areas and in particular Co Cork, where 51,000 customers have no phone service. The company said it expects the numbers of customers without service will continue to fluctuate today. Hundreds of council workers were also deployed across the country to clear roads and to assess the extent of any structural damage to public buildings. President Michael D Higgins has said his heart goes out to those who lost loved ones during Storm Ophelia. Speaking in Sydney today, Mr Higgins said he had been getting constant updates on the situation at home and people would be faced with a range of challenges in the aftermath of the storm. He said he hoped that communities would again come together in a spirit of cooperation. Mr Higgins also paid tribute to the work of ESB crews, for their efforts to restore power to as many people as possible as soon as it was practicable. The Cabinet met this morning where the Government was expected to review the response to Ophelia. In the Dáil this afternoon, Fianna Fáil called for legislation to make it an offence to disobey national warnings made such as those issued in advance of Storm Ophelia. Speaking the Dáil the Taoiseach said he very much agreed with this sentiment. Leo Varadkar criticised those who disobeyed the warnings, saying they had put the lives of themselves and the emergency services in danger yesterday. Managers of most of the country's primary schools have said the closure of schools today was essential to allow schools to assess the damage caused by Storm Ophelia. The Catholic Primary School Managers Association says schools are reporting problems with power and water outages, as well as debris and structural damage. It has commended the Department of Education on what it says was "the correct call" to close schools. Earlier, Minister for Education Richard Bruton said the decision to close schools for a second day was taken in the interests of safety and to provide clarity for everyone concerned. The vast majority of schools will reopen tomorrow. The CPSMA says it expects some primary schools to remain closed, particularly those that have been affected by cuts to their water supply. The Health Service Executive had said it expected outpatient services to be fully operational today, with a small number of exceptions. Some procedures were cancelled to help services deal with extra pressures after yesterday's storm. The HSE said that, while it would have been necessary to cancel some planned operations, urgent procedures would have been protected.